You buy an appliance, it comes with a manual. You buy a LEGO set, it comes with a manual. And let’s not even get started about a certain large scale Swedish store with hard to assemble furniture and great meatballs! While many companies are opting for digital user manuals and only placing Quick Start Up guides in with their products, many more still provide a manual. The thing about user manuals is the very day you throw them out, I mean literally THAT DAY, the machine in question will go bezerk. Or it’s the day you’ll have a power outage and you won’t remember how to reset the clock, so you’ll have to stare at a flashing clock forevermore. You can put your hands on the one you need, precisely when you need it. They’re not scattered throughout the house like lost children. 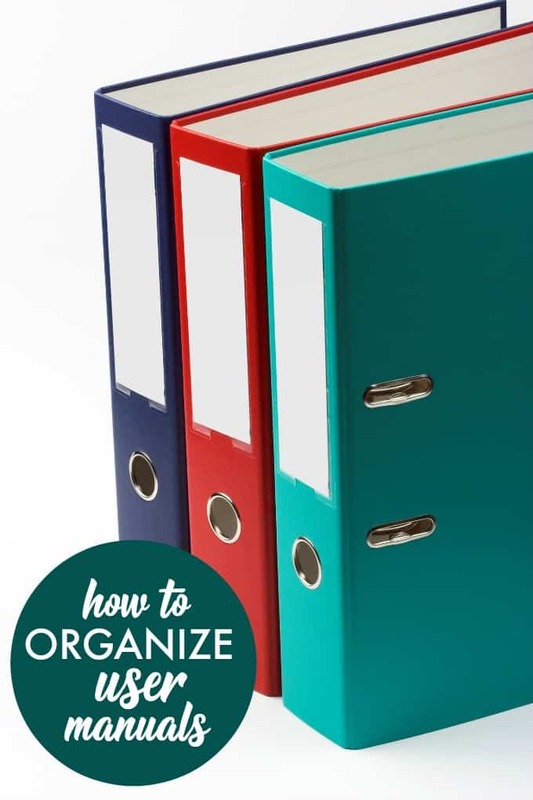 Before you can organize them, you need to find them. Scour the house and collect them from every nook and cranny that they’ve been stuffed into. First stop? The junk drawer. There’s always one or two in there. This is probably a good time to remind you that you should ALSO banish the junk drawer, but that’s another post. It might not be convenient to store ALL of your manuals for ALL of these categories in one place, so dividing them up will help. If you have warranty cards or information for any of these, place them in the appropriate pile. Odds are you’ve collected some manuals for things that you don’t even own anymore. Pitch those directly into the recycling bin. Then go through and decide if you need the manuals that remain. For example, you might have a manual for a toy that needs batteries and the manual contains a quick sketch on how to change the battery and little else beyond disclaimers and other legal jargon. Check the toy and if the battery hatch is self explanatory, you can ditch the manual. Kitchen appliances, small and large, as well as laundry room appliances and furniture assembly can all be stored together and placed with cookbooks. Electronics unrelated to the kitchen or laundry can go in another and be stored in the office / den or where you have the majority of these items. This would be a good place for software manuals too. Toys / LEGO can be stored in each child’s bedroom. Now that you’ve pared down your piles and know what you want to keep and need to store away, here are the two best methods for getting the job done! Use the dividers to separate by your original types (small appliance, large appliance, etc.) for quick scanning to find what you need. Use the sheet protectors to place one manual / warranty information card per document, so you can flip through and find what you need. TIP: Unless you’re good at storing the special assembly keys provided with furniture from certain companies, a great idea is to tape the key inside the sheet protector for that manual. You’ll never wonder where it is again and when you need to disassemble the piece to move or sell it, you’re good to go! This method is for those of us who really want to get rid of excess paper. You can scan the relevant pages of your manuals and store them in ‘folders’ named for each type. The advantage to this is that you’ll always have them available to you from your phone or a computer, without taking up shelf space. Next time your fridge is on the fritz or your mower goes off the rails, you’ll know where to put your hands on the manual so you can troubleshoot the problem and get back to doing what you were doing! You might also like these posts: How to Keep Clutter Off Your Counters, How to Organize LEGO and How to Organize Your Bills. We keep all the manuals in our kitchen junk drawer and eventually throw them away a year later, which isn’t the best idea , so these tips are really useful. i have some old binders in the garage that I can definitely use for this!